Amsterdam is a remarkably tourist-friendly and safe city - but it's always best to stay on the safe side. Keep an eye on your belongings in busy spots like the Centraal railway station or Dam Square. With cheap flights from budget airlines like EasyJet abound, most visitors to Amsterdam, these days, arrive by air. A proper international hub, and the largest airport in the Netherlands, Schiphol serves hundreds of destinations, including most major airports in the UK. Public transportation in Amsterdam is organized by GVB, which runs an efficient system of trams, buses, a few passenger ferries, and a small metro system throughout the city and its environs. As a member of the Eurozone, The Netherlands uses the Euro currency alongside Austria, Belgium, Cyprus, Estonia, Finland, France, Germany, Greece, Ireland, Italy, Luxembourg, Malta, Portugal, Slovakia, Slovenia, and Spain. Festivals in Amsterdam - A calendar of festivals and annual events. Culture in Amsterdam - Where to find the best museums and concert halls. 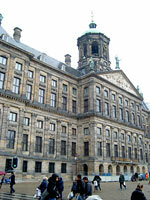 History of Amsterdam - A comprehensive look at the history of the capital. Coffeeshops in Amsterdam - Smoke like a pro or simply learn about the leaf. Cycling in Amsterdam - Dos and Don'ts for every aspiring Amsterdam cyclist. The best place to start your exploration of Amsterdam is undoubtedly Dam Square - the spot where the Amstel river was first dammed, giving the city its name all those years ago. Surrounded by imposing buildings like the Koningklijk Paleis (Royal Palace) and the Niewe Kerk church you can truly feel the history in the air. In fact, the city's oldest neighbourhood of De Wallen is just a few steps east of Dam Square, accessible via Damstraat and the many pretty canals which take you into the Red Light District and Chinatown. Further east is the Nieuwmarkt, the Old Jewish District, and bustling Waterlooplein. Alternatively, walking west from Dam Square will lead you towards calmer grounds through the Golden Age-era Grachtengordel district and the hip Nine Streets neighbourhood, known for its quirky, fashionable shops, and located between the Singel and the Prinsengracht canals. 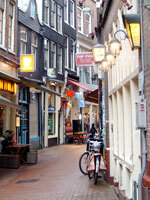 Further west you'll find the quiet, idyllic Jordaan, home to the popular Anne Frank House. Intersecting Dam Square is Niewendijk (to the north) and Kalverstraat (to the south) - essentially one long pedestrian street, constantly packed with both locals and tourists keen to browse the high street shopping on offer. Heading north will lead you to the Centraal railway station, and walking south will steer you towards Spui which is where you'll come across the serene Begijnhof courtyard. Continuing south down the Spui you'll hit the Singel canal, and crossing the next bridge will find you at Koningsplein square with the famous Bloemenmarkt floating flower market to your left. Walking down Leidsestraat from Koningsplein you will eventually reach Leidseplein square, one of the city's central points for dining and entertainment. 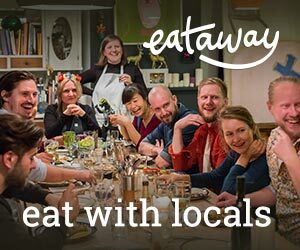 The surrounding streets are home to countless restaurants, bars, and clubs, and some of the city's top venues are located here including the Melkweg cultural centre and the Stadsschouwburg theatre. Turn left to Weteringschans street for a few minutes to reach Max Euweplein square. It's a bit of a tourist magnet (what with a casino and a Hard Rock Cafe), but it's also a reliable spot to find tourist-friendly services like bike rentals and canal boat tours. This is a good introduction to the city. Perhaps a bit more about the canal boat trips would be helpful.